Sunday was “As Sweet As” it could be, with bright sunshine and specific instructions from Dean that the winter rain was not allowed to spoil the Cruise. A group of southern members brought 5 new Mustangs and 4 classics Mustangs and met up at Big W, Cumberland Park, while the northerners gathered a further 8 Mustangs at the delicious Crispy Cream outlet on Main North Rd. You guessed it… the slow Red 1966 Mustang arrived at Crispy Cream first, followed by the 5 new Mustangs. They must have been stuck in first gear all the way?? The cruise from Big W was without incident but, as so often happens, traffic lights got the better of the convoy and so we all arrived at Crispy Cream at different times. No problem though as we all observed the speed limit, as good, law-abiding Mustang owners (almost) always do. 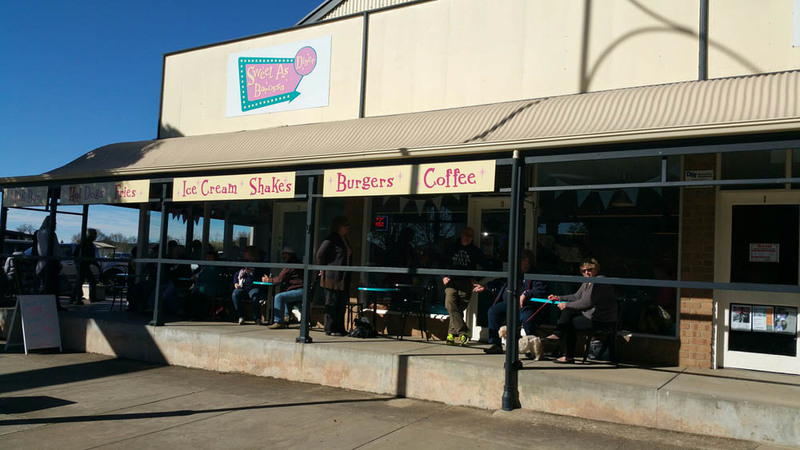 The impressive convoy arrived in Tanunda at around 12.30pm and, within minutes, had set its sights on the chosen venue, the 1960’s styled “As Sweet As” Café. With a welcoming ambience and wonderful menu, the hungry crowd was quick to order from a range of traditional big Aussie & American Hamburgers, Hot Dogs and Shakes. It was the perfect setting to enjoy each other’s company. We got to meet new members and some new Mustang owners who had been invited along to join the Run.